Many of you know that I'll be presenting the premiere performance of a work commissioned by the Johan Franco Composition Fund. The composer involved is Michael Torke. I just sent a write-up to Carillon News, part of which I'll extract here. I want to present him and other music of his first, and will later comment about the carillon work. 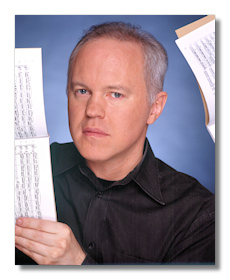 Michael Torke studied at Eastman School of Music and at Yale. At 23, he cut short his graduate studies to begin his career in New York City, where he was signed by Boosey & Hawkes, became an exclusive recording artist with Argo/Decca Records, and began a five-year collaboration with Peter Martins and the New York City Ballet. He is one of the defining composers of “post-minimalism,” writing music that utilizes repetitive structures along with musical techniques form both classical traditions and contemporary pop music. He is particularly active as a composer of orchestral scores, many of which have been choreographed by dance companies around the US and Canada. Major works include two large-scale oratorios ¬– Four Seasons, commissioned by the Walt Disney Company to celebrate the millennium, and Plans, commissioned for the centennial celebration of Daniel Burnham’s Plan for Chicago by the Grant Park Music Festival, as well as two evening-length story ballets, and two operas – Strawberry Fields, and Pop’pea, the latter a rock version (!) of Monteverdi’s Coronation of Poppea. He has written a wide range of instrumental concerti, chamber works, and works for chorus and orchestra. In 2003, he founded Ecstatic Records and acquired the rights to re-issue the Argo/Decca recordings of his works. The boxed complete set was selected by the New York Times as one of the top classical albums of the year. He has since issued several new recordings. He seldom writes works for solo instruments, but he was commissioned by the Stecher and Horowitz Foundation to write a piece for their third New York Piano Competition in 2006. The resulting piece is a joyous, addictive piece that begins like one of the more interesting “New Age” piano pieces, but unlike most “New Age” music, it develops and evolves, becoming quite virtuosic along the way. His most recent recording is of a delightful, tropical-flavored chamber work, Tahiti, recorded by the 10/10 Ensemble of the Royal Liverpool Philharmonic. Well, Michael and exchanged much communication, and I recorded several alternative versions of passages for him, and it's all settled. Now I have to finish learning it!! It's powerful, dramatic stuff! It will be wonderful to hear and experience the piece! We spent a lot of time on this, with my trying out several things, four times over if I recall correctly, sending him recordings, and our discussing the effects. It's gripping stuff! Because it's written with the sonorities of the bells so strongly in mind, it's probably most effective on an English carillon (though strong trebles help also). It's very powerful at Culver, for sure!